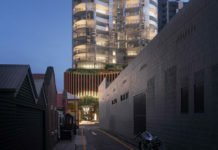 A new DA has been submitted by Treelight Development Group for what will become Australia’s second thinnest tower. Situated at 466 Ann Street, the 37 storey residential tower is wedged between the Mantra Apartments and the New Yorker and has a site area of 486 sqm. The ultra-thin tower measures just 9 metres wide, and almost steals the crown of Australia’s thinnest tower from Melbourne’s Phoenix Apartments which measures just 6.7 metres wide. 466 Ann Street, is however 9 levels taller than Phoenix Apartments which is only 28 storeys high. Signifying Brisbane’s continued appetite for inner city apartments and diminishing developable land, the pencil thin building follows an international trend of more slender towers which have been helped by advancements in building technology, engineering and fabrication. Slender towers are becoming the norm in cities like New York which has extremely limited land and unlimited hight restrictions. Most notable, 111 West 57th Street in Manhattan is the world’s thinnest skyscraper, measuring just 13.7 metres wide (82 storeys) and due to be completed in early 2018. 66 units – 65 x 2-bed units and 1 penthouse (4-bed) unit. 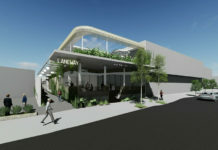 315 sqm dual level retail (bar) space at ground level. A new cross block link to Perry Lane. Podium rooftop communal pool & BBQ area. Podium communal office space & boardroom. Rooftop function room and lounge room with balconies. The Ann St proposal is envisaged as a timeless residential development, capturing the essence of inner city living in a subtropical climate. The pure curved form of the tower is emphasised by the elegant material palette and refined detailing. It is designed to be viewed in the round from the prominent view points throughout the city. The residential programme of the building is highlighted by the expression of the balconies. The building is a unique and monumental tall and slender architectural addition to the city centre. The previous development application for this site was back in 2009 for a 13 storey residential building known as The Apple Apartments by Aurora Pacific. The DA number for this development is A004374946. No more residential apartments in Brisbane! Haven’t we had enough apartments in the city! As a resident in 460 Ann street, New Yorker, I strongly appose to this ridiculous high apartment to be built beside our old little building. You live in a CBD, don’t be ridiculous. If you want low rise, move to the suburbs.